Freely Rotating Masts within Tabernacles for CS 17 mk 3? Anybody have any ideas on retrofitting my CS 17 mk 3 tabernacles to allow the masts to rotate freely? I love the freely rotating masts on my CS 17 ‘Lively’. I like the way they follow the sail when on a run allow it to go forward of the mast when necessary. This is also great when running onto a beach which I do occasionally here in FL. What I like best is the ability to quickly furl the sails by rolling them on the masts. Not for reefing but for rigging and unrigging the boat for trailering. On ‘Lively’ I have to lift the sails up and drop them into the mast support tube (not sure what it is called) which is not a problem because even with the sails wrapped on them they are very light and manageable. Another thing is I can store her in my garage. The masts on the CS 17 mk 3 in tabernacles are easy to raise but seem to require two people one to hold the mast while bolting it down and then you have to hank on the sails, etc. I have found on ‘Summer Breeze’ my CS 17 mk 3 that hanking the sails on and off is very time consuming for just day sailing. Maybe I am just not used to the process yet but it seems like the mk3 is much harder or at least more time consuming. Granted she is really designed for multiple day trips. A second advantage I see would be to have the ability to pull the masts out of the tabernacle and hang in the garage or at least eliminate the masts sticking out 3-4 feet on the ends. Another goal is to be able to store ‘Summer Breeze” in my garage straight in as opposed to now I have to place her crosswise and she takes up practically the whole two car garage. I will also probably have to put a hinge on the forward end of the trailer. I do understand I will lose the sail battens and some performance. Here are my musings on how it might be done. I would make a fiberglass/epoxy tube just as it did for ‘Lively’. This tube would then either need a big buildup of epoxy/fiberglass to give it the strength it would need to carry the hinge bolt or epoxy it into a box. The box would then carry the hinge load. Of course the current tabernacle Ubox would have to be expanded enough to handle the tube/box within it. I did a quick investigation and it appears that this may be possible within the space that is there. The problem may occur at the bow. It will depend on how wide the tube/box is. Please feel free to shoot holes in anything I have said above. Am I crazy to even think of doing this? Maybe Graham or Alan has already thought about this. I understand your frustration on having to hank the sails on and off each time you go sailing. Especially on a hot Florida summer day at a busy ramp with angry power boaters cussing you for taking so long! How about leaving them on the masts. You would need a special sail cover/bag to protect them. I never tried to leave them on when I had Summer Breeze, but the original plan with the tabernacles was to be able to lower the masts with sails in place in order to go under the low bridges crossing some of our mountain lakes. You'd loosen the snotter before dropping the masts. I don't know if the battens would need to come out. I think they probably would. Seems like Graham had discussed the special bag/covers at one time. This, of course, doesn't solve the problem of storage in the garage with masts in place, but you could pull the pivot bolt out to move the entire mast/sprit/sail assembly out of the way. As for pivoting masts, seems like the pivot bolt would be the problem. You need enough "bury" to support the masts. I guess that doing away with the tabernacles and using a tube similar to the Mk-1 would be the answer, but I'd hate to loose the ease of raising and lowering the masts in a tabernacle. Especially if you ever do it with the boat rocking in the water. By-the-way, I never had help with rigging the Breeze. I always sailed alone. I wish that I had an easy answer for you. I, like you loved the simplicity of Lively's rig. If only we could find an efficient way to reliably to reef Lively's rig. Because I also like to sail a well performing boat I just can't give away all of that sail area and because I am silly enough to put myself into harms way I need to reef often. I will just have to tolerate the extra time it takes to rig. I am getting it done quicker with practice and gradual refinement. I am sure that we can figure out how to make the masts rotate but the tabernacles will have to be chunkier. I am working on a latch that automatically holds the mast up while you spin on the wing nut. Dale, this is a big concern of the rig on Jazz Hands. Boats that take a long time to rig don't get used as much. I have no intention of selling my Sea Pearl because of this. Having the sails on the masts gets me in the water in 10 minutes tops. I can be a couple of miles away from the dock while friends are still rigging. It makes a 2 hour sail a reality. I just don't see that with the sail track/sprit rig. I've come to the reality that everyone has a different design objective. Graham and Alan are racers and I love that my little 11N is a rocket-ship when I take it out. And I expect the CS20.3 I'm building to be no slouch. I just spent a week on a relatively low performance boat and it was frustrating at times. But there is a part of me that would love the rig of my sea pearl on the 20, even if I had to step the masts without tabernacles. And a little lug rig on the 11N that I could deploy in 5 minutes would allow me to sail it more and motor less. BTW....The high roach sails that Sea Pearls have use vertical battens. But the roach on the 20 is considerably larger. Pondering rotating masts with tabernacles is as much fun as pondering perpetual motion. Thanks guys for your input. I appreciate it. I see that there has been no rush to offer a new wizbang tabernacle for you so I have gone to the drafting board to draw one that was in my head a while back. I also liked the rotating mast I had on my Bay River Skiff LOON for its simplicity, ease of rigging at the launch and permanent storage of the sails. Going to sail tracks and battens with leech roach changed all that. Some performance was surely gained but at the loss of a lot of time and convenience and I really missed the former ease of handling in launching and docking, especially into a downwind dock or beach. With the years catching up to me, I also was starting to need a tabernacle on the main and about two years ago I designed a tabernacle that would accomplish both objectives. Details were not completely worked out and some things needed refinement when it was actually laid out on paper following your request. This sketch shows the resulting unit. I actually gave LAPWING to my son Mark and it now sails on coastal Maine where he and Jan live on Georgetown Island. It should be pretty clear in that there is little difference in the actual construction other than the ears on the side that allow for the pivot bolt to attach to the mast tube. I would make that collar of fiberglass bonded to the tube. Based on past experience the sides of the tabernacle should be made very strong to take the stress of a bending mast in a breeze. I’d wrap it in 1808 biaxial non-woven glass and add a through bolt near the top. The added ears should be made strong to take the expected stress as well. Another change from the normal CS tabernacle is the lock at the base. The bolt works fine but often calls for some fiddling hands on work to get it fitted and secured. The flip board shown should hold the mast in place securely at the base with no hand-on needed. If the spring loaded hinge is not considered secure enough in the event of a capsize, a magnet under the board near the mast should add more security. A trip line could be rigged so the release could be done remotely for easier single handing. If it were mine, I would have no battens in the sails and wrap them on the mast permanently. There is a sailmaker in Florida who makes sails with vertical battens that may look a bit off to traditionalists, but seem to work well. These can be wrapped around the mast.`As on LOON, the masts/sails would be stored in a canvas sleeve and placed in cradles above the mast tubes. This is great for traveling as well as a tarp support for storage. Tom, this is clever. I'm building the stock rig, but if I find it takes to long to modify I may experiment with this. Those Vertical battens do look a bit goofy. Thank you so much for the drawing and explanation. You have covered exactly what I was looking for. Now I have to decide if I want to or can retro-fit it to Summer Breeze. I really appreciate your spending the extra time to laying it out on paper. One thing I don't think I have mentioned is that on Lively early on I had the original sleeve sails converted two reefing points on a sail track. I did not add battens so the sails they easily/quickly wrap on the masts and I just pull them out and cradle them on PVC posts inserted in the mast tubes like you mentioned. I have seen the vertical battens on Sea Pearls around here and yes they look funny but seem to work. The sail tracks and reefing points seem to work very well so I do not have a problem with having the tracks. I don't have a drawing of the CS17 so don't know how much space is available in front of the mast. Some builders have installed a tabernacle on a CS17 so there may be adequate room for the flop board mast lock, which I think is a plus to have that way up in the bow so you don't have to go there underway if you need to. I have seen a similar mast lock on another type boat but nothing quite like this or part of a tabernacle. You would be the beta model although I'm pretty certain it would work. There are other methods for rigging a gate at the bottom of the tabernacle that don't require any additional room forward of the mast. The purpose of any of these base locks is to avoid the need to manually set up the bolt. I know Sea Pearls have roller furling with a boom and an out haul. I like that setup, but it requires a vang. Has there been a sprit rig that has the sail furled around the mast? I can't imagine how that would work, but B & B has amazed me before. All the early B&B cat ketches did. We just did not reef them, although a few people made some apparently complicated arrangements for reefing them. Some traditional sharpie workboats reefed by brailing up the sails to the masts. I have now had some time to study your diagram. 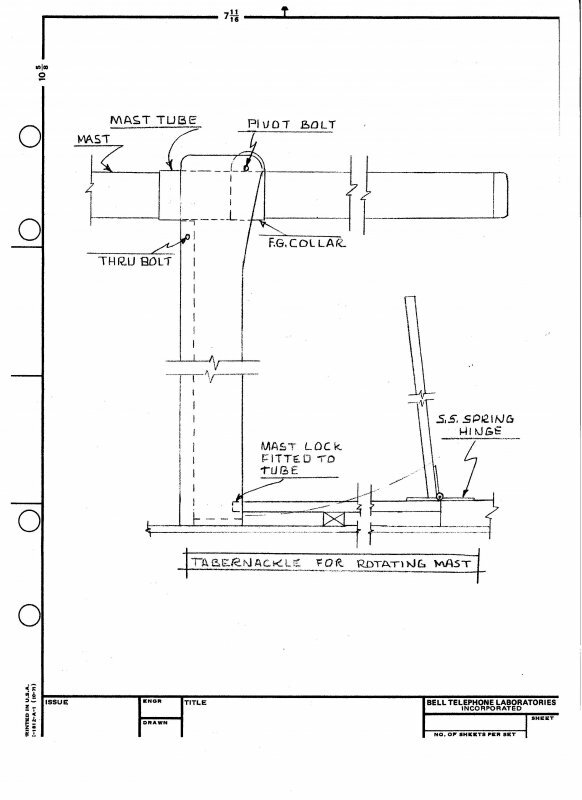 I believe you mean for the mast tube to continue to the bottom of the mast but I could not tell from the drawing. Is this correct? Also, how do you envision the shape of the FG tube collar from the mast bottom (right end view)? Would it be a solid mass of epoxy/fiberglass with the pivot bolt going through it or possibly a wooden box or solid wood with aft side shaped to fit the mast tube? A problem in trying to retrofit would be, right now there is about 3/16" clearance on each side of the mast. I believe if I remember right when I did the tubes for Lively I used three wraps of 6 oz plastic and about three wraps of epoxy glass which is quite a bit thicker than the clearance I have available. I guess I will have to widen the inside somehow to accommodate the the thicker mast/tube combination and then put doublers? 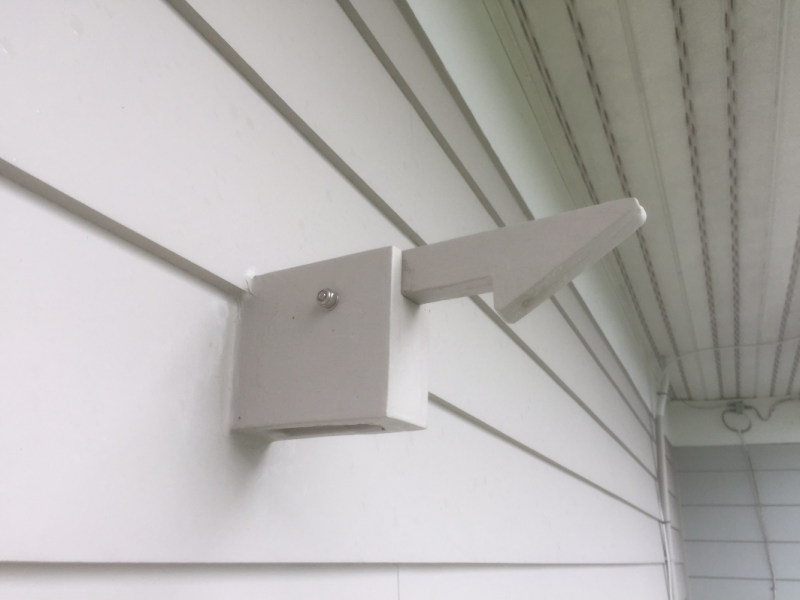 on the outside of the u shaped post. It appears that your hinge lock would work and be very strong. However, it would end up being about 9" off the anchor locker floor so would require a 9" high by 3-4" wide by about 17" long at top sort of box to mount it on. This is definitely doable but the problem is that it is then located directly in the middle of the anchor locker where the anchor rode is currently being stored. I do not have to worry about anchor storage there because Chick mounted an anchor pulpit. I am wondering if some sort of flip latch or two one on each side mounted on the tabernacle post would work and use less space. I tried to attach a photo of a latch I did for holding a door open but it did not work so will try later. Thanks. I have recently snapped a free-standing rotating mast. In the process of fixing it I also plan on adding a hinge for ducking under bridges. The basic idea is to split the mast above the mast collar, fix the tabernacle to the bottom mast stub. Now the entire tabernacle can rotate. The rest of the mast hinges in the tabernacle as before, with the advantage that the tabernacle is always aligned to best support the direction of force on the mast. I did design a second version based on Dale's problem with space at the base of the tabernacle. I sent it to Dale by email for his comments but have not heard in return. I think it is a better solution in that it takes up no additional room in front of the mast base and is remotely locked and released by control lines so you don't need to gain access to the base of the tabernacle to operate it. 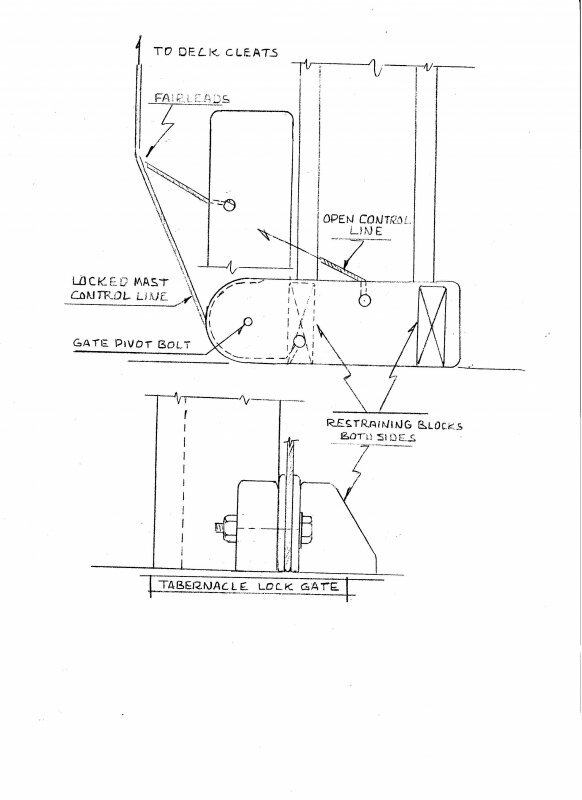 This lock could be retrofitted to an existing non-rotating tabernacle to eliminate the need for operating the bolt/wingnut which some find a bother. Tom, do you have a drawing of this? Sorry Tom. I have not received your email. Obviously, I would like to get it and see what your thoughts are. Please resend it to me. I like your idea William but it would seem to have a great amount of stress on the hinge. It would have to be very strongly constructed. Do you have any drawings or more specific ideas. With the typical unstayed mast they have a lot of flex. It seems that the hinge would distort the bending. What size is your mast? Wood, Alum or carbon fiber? This is the second version of a mast gate for a rotating tabernacle. Something went haywire but it apparently uploaded anyway. The forum attach process seems to have changed today.